All things considered, I think just one casualty isn’t bad, and he was pretty easy to fix. The two things I really worried about – the ears on the paper mache baby elephant and the horns on the antelope head – suffered no damage at all during the move. 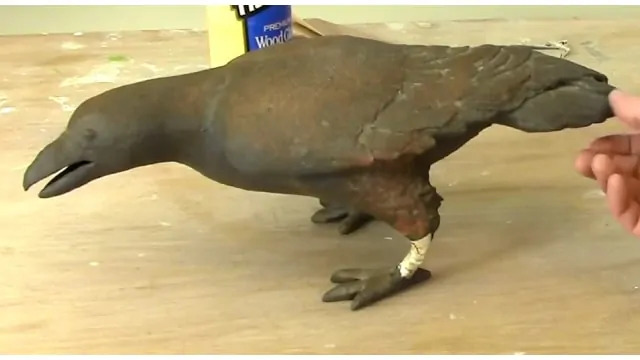 I used the air dry clay recipe when I first made the raven, so he might not officially qualify as “paper mache,” although the recipe does contain a lot of paper, and the way he was fixed will work no matter what type of paper mache the item is made with. Doing the repair was remarkably easy, with just a few torn strips of newspaper and some Titebond II wood glue. That stuff is incredibly strong. I’m very glad that the raven’s legs have a wire inside, since the wire helps the strengthen the newly repaired leg. It also kept the pieces together, so I didn’t have to go searching through the box to find the feet – that would have been really discouraging. Since the glue is strong and dries really hard, I’m sure this same method will work for any broken paper mache sculpture. If a piece is crushed and a portion of the original shape is damaged, it might be necessary to fill out the missing space with crumpled paper or aluminum foil, and then continue with the paper and glue. Small indentations might be rounded out with some spackle, which would then be covered over with the paper and glue once the spackle is completely dry. A hollow piece that’s missing a section would need a temporary support on the inside, at least until the new paper and glue has a chance to dry and become hard. Hi Ken. I’m not an expert for repairing valuable pieces of art, but if I had a piece like this I’d probably use a mixture of carpenter’s glue and water as the paste, along with newspaper. If the paper is saturated with the mixture but not dripping wet, it will dry quickly, and it will be very strong. You would be able to use very fine sandpaper after it dries, to smooth the connection between the old pieces and the new pieces. If you can reach the inside you could fill it with something, but it might not be needed if you can get all the pieces together without support. If you do need support, and if you can reach the inside easily, crumpled foil might be easier to work with. another option would be to support the three big pieces with plaster cloth on the inside. Then put the pieces together and fill in the smaller pieces with paper mache over the plaster cloth. This might give you some ideas to start with. Good luck with it! I need to repair an antique japanned papier mache vase, about 30 inches tall. It was dropped and part of the base collapsed and bent, so the vase is now tilted. I’m wondering if it is possible to soften papier mache and reform it, thus restoring its shape. Once I have it reshaped I can reinforce it from the inside to strengthen the repair. Any suggestions you can give would be most appreciated. Hi Roberta. I would suggest that you contact an antique dealer and ask if they know anyone who can help you restore your vase. That way, you’ll know that you’re getting expert advice. I repair my own sculptures when the cat knocks them on the floor, but I’m not an art repair expert by any means. As for your specific question, it might be possible to soften the paper mache, but there’s no guarantee that you would like the results. If you don’t have an antique dealer nearby, try calling an art gallery or museum for a reference. If the repair is small enough, it shouldn’t cost too much. Hi there! I googled and found you. 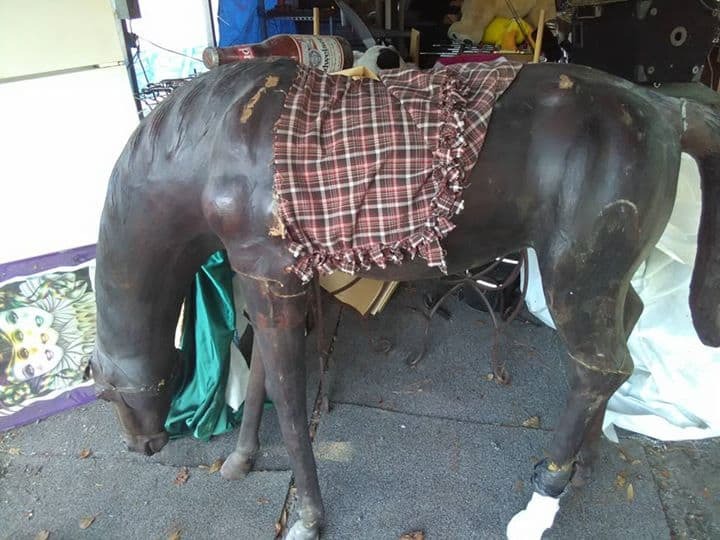 We have an opportunity to purchase this large papier mache horse. He is really beautiful, but has extensive damage – broken leg, tail, and it is really big. His leg has to be repaired for the horse to be stable. Thoughts on this? Additionally if we can repair all the breaks, wondering if we could coat him entirely in Bondo or some type of fiberglass or epoxy to make him waterproof. He’s too big to keep in the house and would be a gorgeous statue in front of our horse barn. Any thoughts? If the broken leg is hollow, you might be able to stabilize it by covering the break with some duct tape, then drill a small hole and use the expanding foam that is made to seal up cracks around windows. The little tube that comes with the can could slip into the hole, so the foam wouldn’t get on the outside of the leg. The foam requires water (not much, but a little) to cure, so read the instructions on the can to see if you need to mist the inside of the leg before taping it up. Once the foam cures, you could remove the tape, and the leg would be fairly smooth. Another possibility is to use several layers of plaster cloth around the crack. It would add some texture and additional thickness to the leg, which would probably need to be sanded before you give it the final waterproof coating. You can find plaster cloth at a hobby store, and the plaster cloth is strong enough so you shouldn’t need to bother with the foam if you also cover him with fiberglass or some form of epoxy. Epoxy clay would be waterproof. I’ve been playing around with it lately, and it’s not hard to get a nice thin layer, although it takes a lot of time. Apoxy Sculpt seems to be the least expensive brand. You could start with the four-pound container of Apoxy Sculpt and see how far it goes before ordering more. The epoxy clays like Apoxy Sculpt give you plenty of time to work and you can get a nice smooth coat, or you can texture it if you want. I think Bondo goes hard really fast, and you don’t have much time. As with the foam coating I’ll mention below, you’d need to make sure there were no pinholes in the epoxy that would allow water in. You might be able to find a automobile body shop that would have the equipment for covering him with fiberglass – they have all the safety equipment that’s needed, and most of us don’t. There are also materials that are used to give a hard waterproof coating to foam, like the the big sculptures and signs at amusement parks – and I think there are some that can be brushed on. You would need several layers, because even a pinhole in the coating would allow water to seep in, one drop at a time, and the water would eventually destroy the paper mache. Even if that didn’t matter, the water could freeze and the expansion would cause cracks in the sculpture. Do a Google search for foam coating if you’d like to read up on it. I believe some of them create fumes and would need some safety equipment, and really good ventilation. They should have all that information on the website where the products are sold. Karen Lanchester recently made a short video for us about the baby elephant she made with her son. She told me that her next project is a life-sized cow that will live on their lawn. She intends to use fiberglass on the cow, and seems quite knowledgeable about it. If you leave a comment with your photo on her guest post she may see it. If she does, I’m sure she’d be willing to answer questions for you. I’ve never worked with fiberglass, myself. Whatever you do will probably take some time, but won’t it be fun to have him out in front of the house, grazing on the lawn? Keep me posted! Hi jonni good, i am a 70 year old woman with no exposure to the art world till my forties. I had been making clay models with whatever available materials from around and used to feel frustrated when the product disintegrated. first time in my life i am coming across an artist who has opened up a whole world with such large heart.and revealing the secret . i dont know how to thank you. now my problem is , i have made a model with modelling clay not knowing it is never going to dry! i have taken so much pain to sculpt intricately the whole figure. can i use a layer of paperclay over this figurine? will it stay erect? please help me. Yes, you can put the paper mache clay over modeling clay. How to do it depends on what kind of modeling clay you have. If your modeling clay contains oil, it will never dry. It will need to be removed from the inside of your sculpture after the paper mache clay is dry, because the oil in the clay will eventually seep out through the paper mache clay layer, and ruin the finish. If you’re using water-based modeling clay, it also needs to be removed, but for a different reason–it will take ages to dry all the way through, and that will keep the paper mache clay from drying, too. Mold will develop, ruining your sculpture. If possible, place a thin plastic sheet between the modeling clay and the paper mache clay layer. That will make it easier to remove the modeling clay, and will allow the paper mache clay to dry if you’re using water-based modeling clay. Happy Birthday! And thanks for the kind thoughts. I’m glad you enjoy the site. recently I finished final touches to my papiermache installation. I want you to see and comment. Hi Sitara. You could make legs out of cardboard, fill in the shapes with crumpled aluminum foil, and then tape them onto the head. 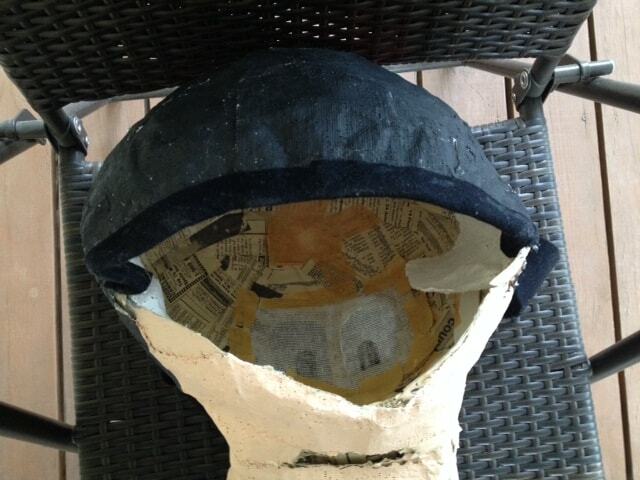 Then cover the head and the legs with paper mache. I have a full size sarcophagus and I am hoping to repair and repaint it. It has fine cracks on the fac wand damage to the front from a candle. I would like to restore it to its best possible state can you please offer any suggestions on what tot do. Thank you. Hi Lauren. If your statue is an heirloom or antique, you’ll probably want to repair it with the same material they used to make it in the first place. Even if you just want to make it look new again, paper strips and paste will probably give you the smoothest results over those holes. For the cracks, you might be able to cover them more easily with the home-made gesso recipe. Hi Abby. Paper mache is really hard to work with when you’re using a balloon for a form. I know that it’s a common way to do it, but it’s really difficult. 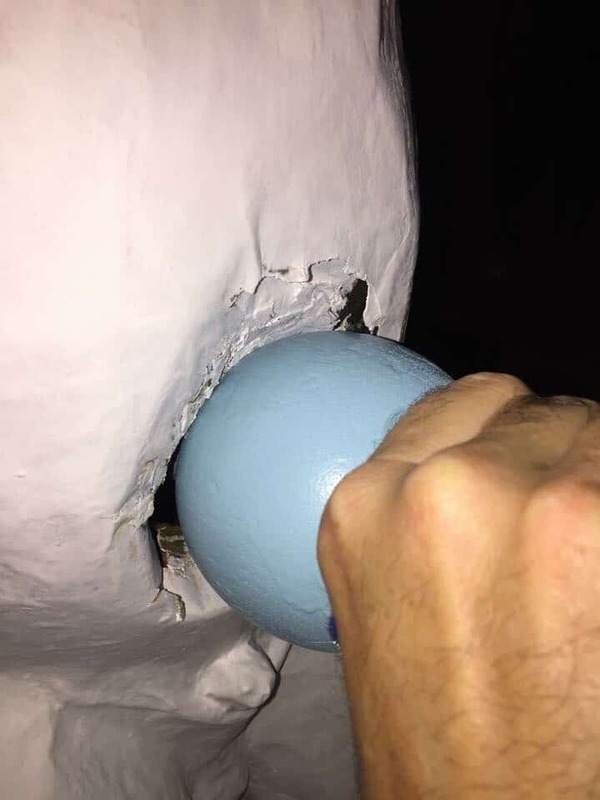 The balloon will change it’s shape on you, causing the paper mache to crack or scrunch up, and if the paper mache doesn’t go all the way around the edges will curl up. I suggest using a ball made out of crumpled newspapers, instead. You’ll need some masking tape to hold the paper in place, and you’ll want the form to be fairly solid. Then you can use just a few layers of paper mache, and that will help it dry faster. By the way, the fastest way to get paper mache to dry is to put it in front of a fan or over a furnace heating vent. I hv a question for u Abt how to fix a broken horse carousel made fr paper masche. Short story,my daughter was sitting down on top of the paper masche horse carousel by accident,it made the horse went down & loose fr the horse body to the horse stick & the bottom of the horse where the stick is cracked. There’s a hole on the bottom of the horse where the stick go through in the body & crack on bottom. How to make the horse body going up in normal position & how to tighten it up so it won’t go down,wiggle & loose again? Thank u & hv a great night. Hi Lina. This sounds like a fairly complicated project that someone would have to see in person before making recommendations. One thing that would help, though, is to know how the horse was made in the first place. Was it entirely hollow? Or is there a wooden or metal frame inside it? If it’s just hollow, and the central supporting stick was the only thing holding it up, it might be possible to put in another stick and fill the cavity with expanding foam. That’s just a thought, though. Without actually seeing it up close, it’s impossible to know for sure. If you have a university nearby, one of the art teachers might have some ideas for you. Or even a good art teacher at your local high school. Short story,my daughter was sitting down on top of the paper masche horse carousel by accident,it made the horse went down & loose fr the horse body to the horse stick. I have a repair question that I hope you can answer. I have a large(ish) paper mache Goofy mask that I made together with my incredibly talented, and now sadly deceased grandmother. It was a really good mask and it has lots of sentimental value for me both because I made it with my beloved grandmother and because I wore it the day I met my best friend. The mask is about 25 years old at this point and some of the cloth strips we put inside to reinforce it have dried out and separated from the paper. It’s also become a bit mushy and misshapen on the bottom because I was fairly sweaty the one time I wore it (I was a mascot for a homecoming thing). If possible I’d like to reinforce and reshape the bottom of the mask where it’s started to sort of fold in on it’s own weight a bit. However, it still actually looks fairly good so I really do not want to screw it up and make it worse than it is. Any advice you can give would be very helpful (even if the advice is “leave it alone”) and I have supplied a photograph of the squishy base if that’s of any help. Thanks so much for your time. Hi Rebecca. This is a hard question to answer without actually seeing the Goofy mask in person. Normally, you could repair paper mache using the same materials that were used to make it originally. But if the plaster cloth is separating from the paper, it must be shrinking at a different rate, or something, and there would be a hollow space within the walls of the mask. I don’t think you would want to fill that space, because it could change the shape of the face. If the bottom part is completely dry but still a bit mushy, it could either be because it needs a few more layers of paper mache to make it stiff enough to stand up on its own, or it might be somewhat oily. Try a hidden spot and mix up some flour and water paste. If you use raw flour and water paste when you and your grandmother made the mask, then do the same this time. If you think you used a paste that was cooked, you might want to use that – to keep the same texture and look. But it probably doesn’t matter all that much. Mix up a small batch of paste and stick on a small piece of paper, and let it dry. If it stays stuck on, then you can just add two or three more layers of newspaper and paste, let it dry, and your mask should then be strong enough to stand without slumping. Once dry, it can be painted to match the rest of the mask. My daughter made a 3 demintional paper mache zebra head. Measures 32×12. The dog jumped on it and damaged the right center… Torn slightly and pushed in. How can we repair it? Husband said we can cut into back and apply super glue… I’m thinking no. Is the zebra head hollow? If so, you’ll want to put something inside, like crumpled paper, to support the area that needs to be repaired, and push it out so it has it’s original form. If it isn’t hollow, the dip will need to be filled in with some crumpled paper or crumpled aluminum foil. Then you can repair the damage with paper strips and paste, like your daughter probably used to make the head, or use the paper and carpenter’s glue, like I did when I repaired the raven’s leg. Two or three layers of paper mache should be enough, if the area is supported from inside while it dries. If this is a black and white zebra, without much color added, it shouldn’t be difficult to match the stripes after the paper mache is completely dry. Do you have a photo of the damaged zebra head so we can see it and get a better idea of what might be needed? Then some of my readers might have some suggestions for you, too. Where could I purchase the iron ore paint you use for your Raven? I’m no pri but my daughter is graduating and her mascot is a bison, that would look amazing on it! A bison would look fantastic in the iron coating. I buy mine from Brick in the Yard. They ship really fast – and they have some great videos on YouTube. The product I used was the Iron Metal Coating B, with a spritz of the Tiffany Green patina, from the same company. The patina will give you a little natural-looking rust. Thank you for your rapid response! Btw pri should’ve read; I’m no PRO LoL. Thanks, Ouida. I’ll check that out. I wish I had all this info a few weeks back! I had a sculpture of 2 crows standing on a branch which I dropped and all 4 of the legs cracked exactly like your raven. Oh no…I did repair it by doing some digging out of the surrounding area, reapplying the paper mache clay, sanding, painting, varnishing. It was a tough job, probably tougher than the original sculpture. All is well but your idea would have made the job so much easier. That’s what I get for working on it when I had a broken wrist. I know, I know, I am stubborn! Do you think it matters which wood glue one uses? Do you find this particular brand the best? Hi Eileen. It sounds like your fix will be very strong. I only had the one brand of wood glue on hand, so I can’t say which one is best. And, by the way, you might want to give that wrist a rest for a week or two – that must have been a painful accident! I hope the bones are mending well, and you’re back to normal soon. Thanks Jonni- the wrist is (almost)fine now, I had slipped on the ice this winter. The cast is off and I am rehabbing it, a long process where I realize I am not as young as I used to be! I dropped the sculpture when I still had the cast on and just recently got around to fixing it. The repair seems strong but I am still careful with it. I will be entering it into a show so it needs to be rather perfect. I will take a proper picture of it and put it on the daily sculpture page. Hi Jonni, Loved your tutorial. I really loved that raven when you made it. Had to say that I think your hair looked so good, a little more wisp to it. Hope all the moving is done. Update….never mind. Ha! I found the video once I spelled “nouveau” correctly. Thanks again. I am so glad I’m not the only one who can’t spell that word! I have to look it up every time I mention the company on this site. I’m glad you found it. Excellent vid, thanks for the demo. You mention using a Sculpt Nuveau Iron coating…. Do you have this technique in a video or blog entry? I couldn’t find it using the search box. I so enjoy your posts! I’m a polymer clay artist and have just begun to do sculpture. I am using your recipes for an underlayer that I cover with polymer clay. I’m making a series called The Untamed Imaginary, and another called The Singing Cycladics. This photo is of my Liminal Wanderer #1…. Hi Wendy. I would love to see the Singing Cycladics, but your photo didn’t come through. It may have been too large for the system. Could you make it smaller and try again?